At one of our recent Vine City community meetings a few of the residents came up with a great action idea. 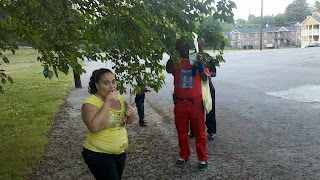 The idea was to get together every Friday at 6pm and walk around the neighborhood as a group. The hope was to build relationships with each other, and to build awareness in the Vine City as to who we are, and why we're here, and how folks can plug in. This past Friday was the kick of Vine City walk, and though it was only around ten of use, it was really an awesome experience. 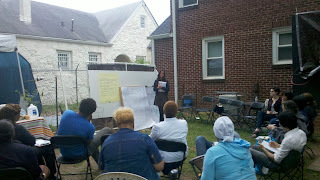 Every one we walked by wanted to know what we were doing, residents actually came outside to engage with the group. 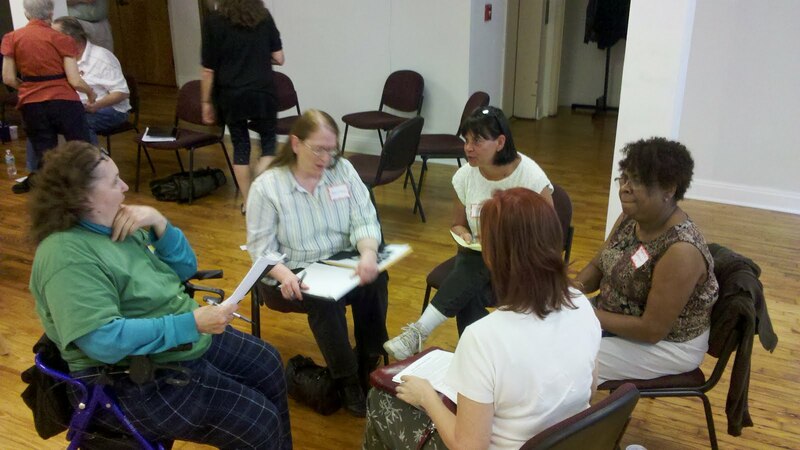 As residents engaged, many ended up putting out their own ideas about the Vine City they want to live in, and perhaps what would be some collective steps to get there. We've been canvassing Vine City for the past few weeks in pairs, Friday's walk really confirmed that there's power in numbers. 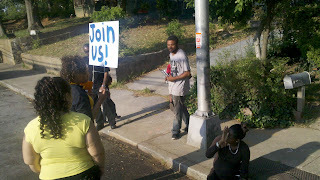 The walk not only was a great outreach tool, it also gave those of use who walked new perspectives on the neighborhood. A few Vine city residents who came on the walk commented, "we never walk the streets like this". We stopped several times to have long conversations with community members, survey an abandoned building, or to stop and eat mulberries. 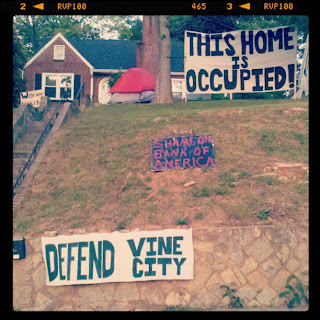 It should be noted that the overwhelming majority of Vine City residents really love the Occupy movement and are glad we are here. Everyone was really excited to keep building this weekly tradition, and we invite you to join us every Friday at 6pm. 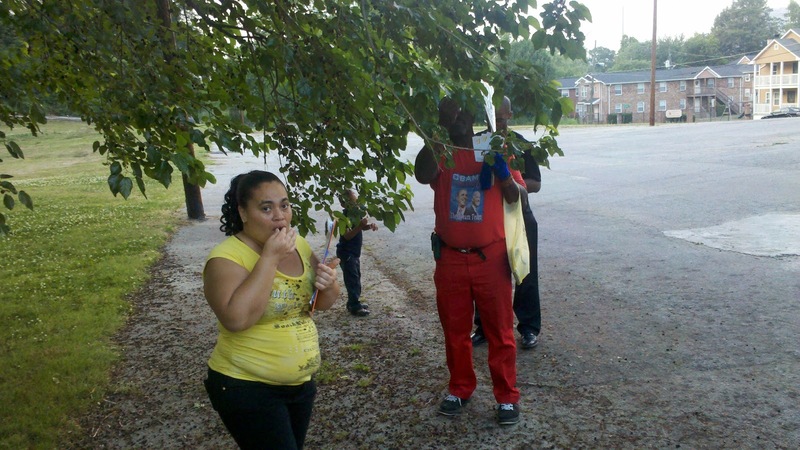 We meet at the home of Pamela Flores, 245 Griffin St, Atlanta. This Past Wednesday Operation Recovery: Right to Heal Tour rolled through Atlanta. 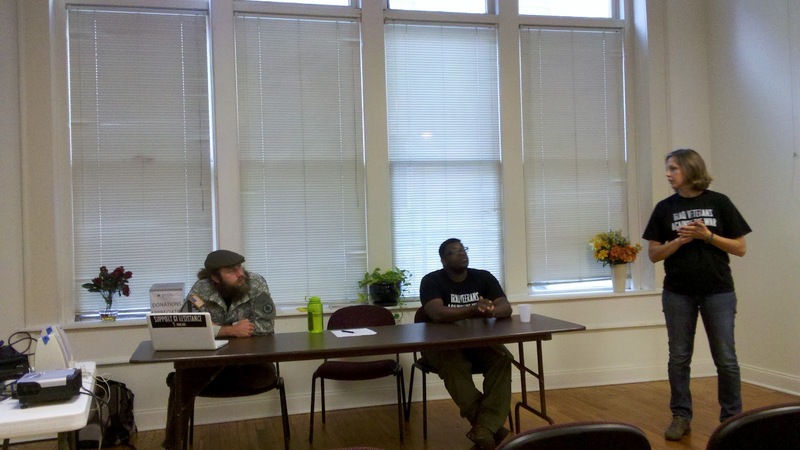 The tour is part of a new Iraq Veteran's Against War Project. The goal of this tour is to raise awareness about Operation Recovery and service members fight for the right to heal from trauma. Large portions of our military members and veterans are suffering from Military Sexual Trauma (MST), Post Traumatic Stress Disorder (PTSD), and/or Traumatic Brain Injury (TBI) yet their right to heal is violated on a mass scale. While traumatized service members have been forced to deploy against the best interest of their health and well being throughout the Global War on Terror now with the return of troops from Iraq the military is trying to skirt it’s responsibilities to care for service members. Military leaders and service providers are giving inadequate care, pushing improper diagnoses, and forcing thousands of service members to leave the military with no care or benefits by pursuing punitive discharges for troops who really need medical and mental health care. Fort Hood. Texas, the Army’s largest base has been hit especially hard with trauma. Regular and repeated deployments over the past 10 years have left soldiers their particularly vulnerable to traumatic injuries leading Fort Hood to have the highest suicide rate (22) by far over any other military instillation. Veteran Organizers who have worked with active duty troops at Fort Hood as well as former Fort Hood soldiers will embark on the Right to Heal Tour, sharing the stories of the work happening at Fort Hood and our upcoming Summer Outreach Drive. Operation Recovery organizers will be out at Fort Hood all summer long meeting active duty troops, collecting testimonies, and building power to take on Fort Hood’s General Campbell and stop the violation of service members right to heal. Public support is essential; through supporters bombarding General Campbell with thousands of emails and post cards we were able to win a “virtual town hall meeting” in January. Now we need to take this further to insure General Campbell not only hears what his soldiers need but also does something about it. Stand with us for soldiers’ right to heal. 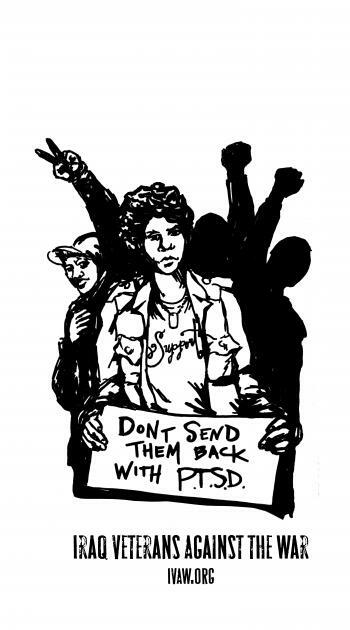 American Friends Service Committee is proud to support the important work of IVAW, and we hope to bring the tour back to Atlanta in the next few months. 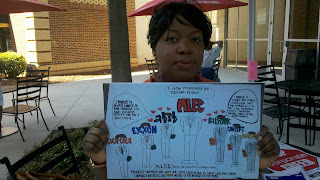 Today I joined about 30 others at the annual Coca Cola shareholders meeting at the Cobb Galleria. It was part of an effort organized by the Killer Coke campaign and Occupy Atlanta to shine a light on the gross injustices. The 30 of us all came with Coca Cola with stocks in our names, which gave us the right to enter the meeting. 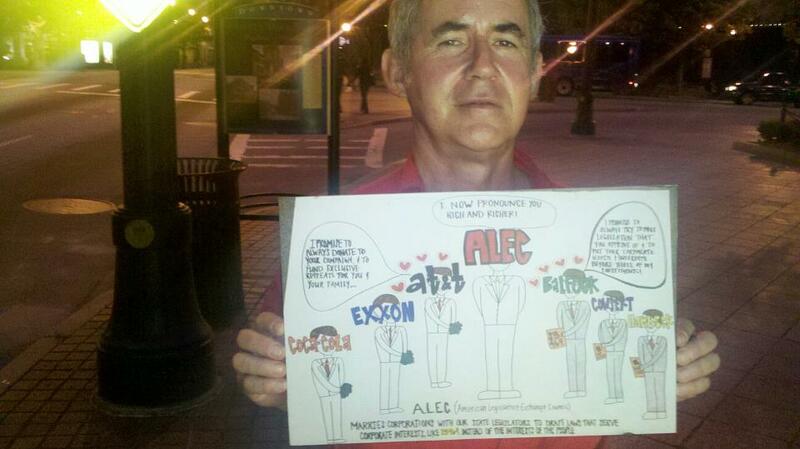 It was my first experience on the inside of a shareholder meeting, and I must say it was truly a disturbing experience. 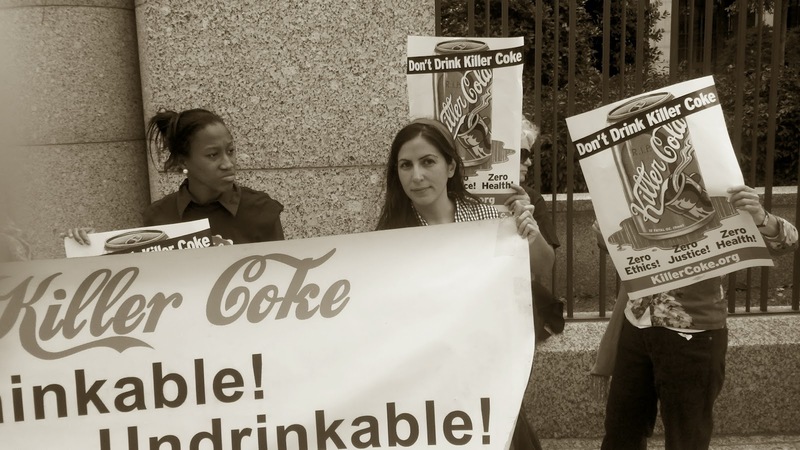 Coca Cola's CEO, Muhtar Kent, proceeded over the meeting, which was full of gross false claims. The face of Coke that Kent painted was one that placed people over profit, strives to be a Steward of the environment, provides children with healthy lifestyle choices, and provides good jobs around the globe. This is public face pushed with a strong PR campaign is a facade. The face we know is quite different. 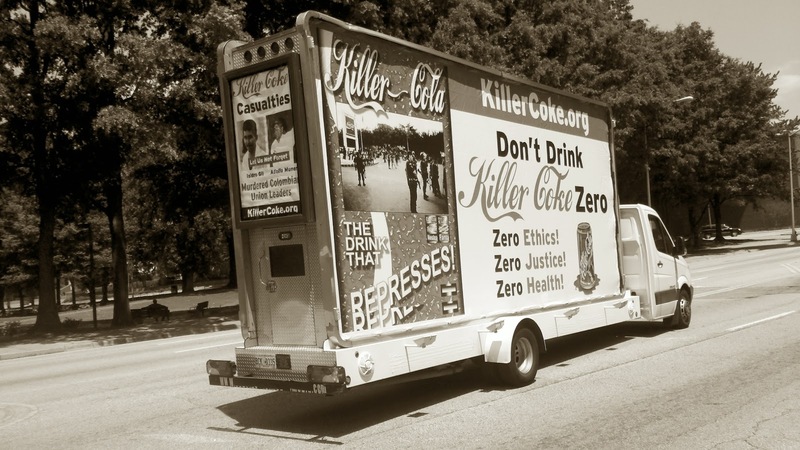 Although Coke spends millions of dollars every year on advertising to market their products with a positive and happy spin, a quick look inside their business practices shows that that like so many corporations, profits take precedence over ethics, morality, and justice. Coca Cola’s crimes reach all the way across the globe. In Latin America, they have been accused of hiring paramilitary forces to torture, intimidate, and even murder union organizers in countries like Columbia and Guatemala. 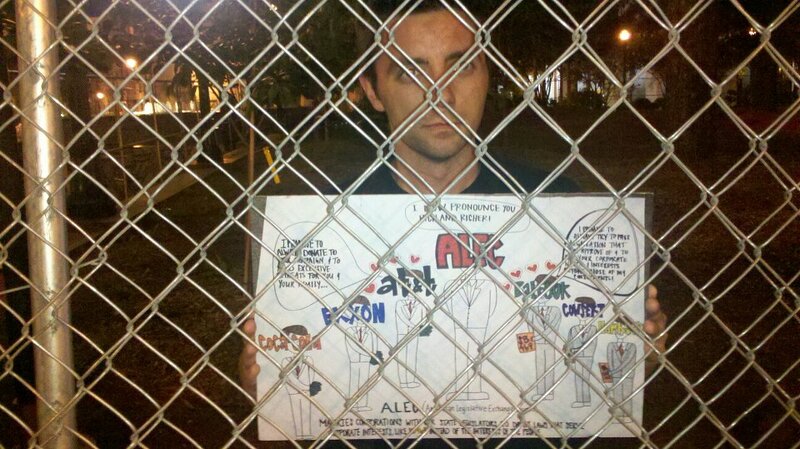 They profit off of child labor used in the sugar cane fields of El Salvador. In Mexico, they use their bought off pals in the government to control the market, making competition against Coke virtually non-existent. In a country where almost every citizen has access to Coca Cola products, over 12 million people in Mexico don’t have access to clean water. In India, their plants contaminate and dry up the water sources, devastating farmers, towns, and the people that live in them. 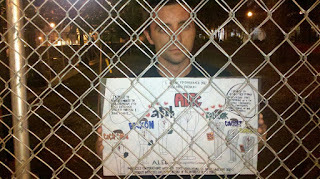 In China they’ve been known to have deplorable working conditions in their factories, and benefit off of prison labor. The list goes on and on. Their crimes are not just international though. 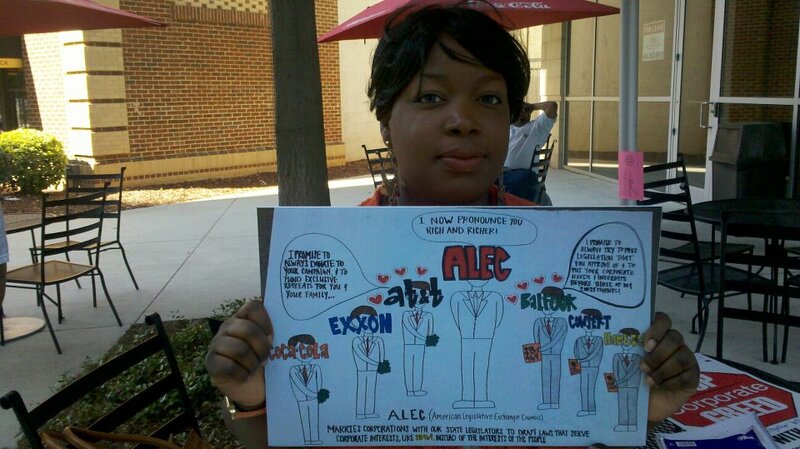 Coca Cola Company and its executives are a classic case of the 1% here at home. 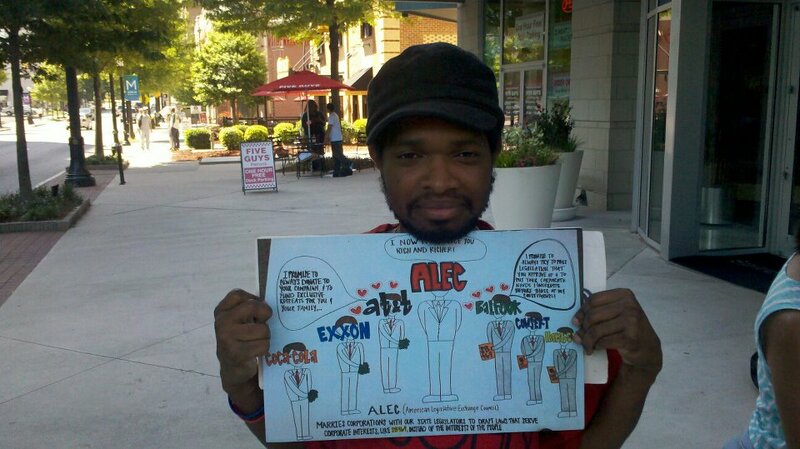 Coca-Cola sits on the board of ALEC (the American Legislative Exchange Council) that produces legislation designed to limit workers rights, deny climate change, keep private prisons full, restrict access to voting, and many other pro-business, anti-people agendas. They spend millions of dollars lobbying our representatives and agencies to ensure that their products can be sold without regulation. They aggressively market sugary beverages to children that have no nutritional value, and are directly tied to record high rates of obesity and diabetes. They avoid warning consumers of known carcinogens in their products, such as aspartame, BPA, and 4-methylimidazole. Their executives, like CEO Muhtar Kent, receive millions of dollars in compensation each year, while average workers around the world are barely paid a living wage, and any attempts to collectively bargain for rights are quickly abolished. And of course they avoid paying their fair share of taxes with billions of dollars held in off-shore tax havens such as the Cayman Islands. Coca-Cola also has a long history of racial discrimination, from their support of the apartheid government in South Africa, to countless instances of discrimination here at home. 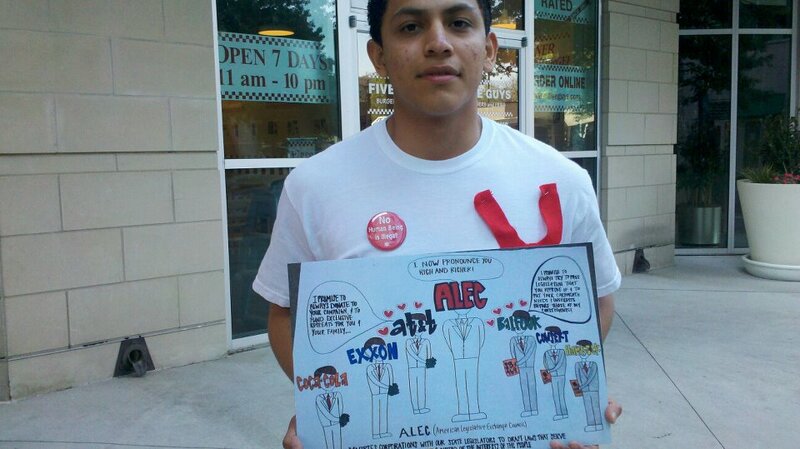 Case after case, workers have complained about the rampant racism that occurs in Coca Cola’s factories, as well as the lack of opportunity for minorities to advance within the company. And although they lack respect for minorities in the workplace, they still aggressively market their harmful products to African Americans and Latinos at higher rates than other groups leading to higher rates of obesity and diabetes. 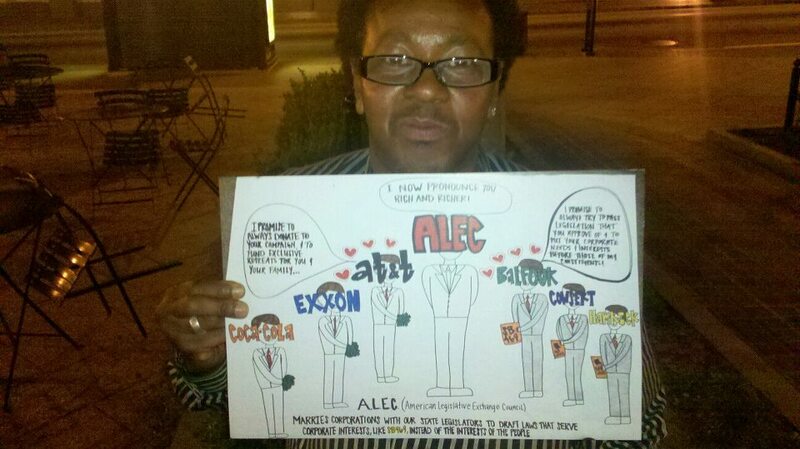 Most recently, through their relationship with ALEC, they have shown their support for the “Stand Your Ground Law” in Florida that is being used as a defense in the murder of Trayvon Martin, an unarmed 17 year old African American boy. 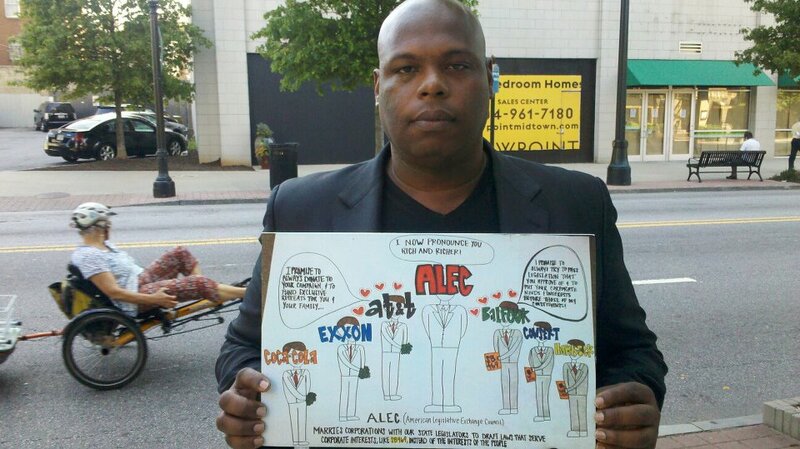 Many credit this ALEC legislation as the reason Trayvon’s killer remained free for weeks. So it's painfully clear, after sitting through the two hour shareholder meeting that there are two very different faces of Coca Cola. 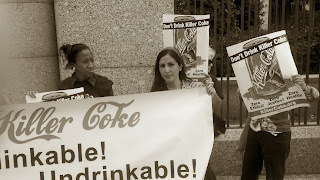 While Coca Cola may spend billions on a friendly public face, there actual behavior make it quite clear the Coca Cola cares much more about profit than they do people, the environment, it's workers, or children. 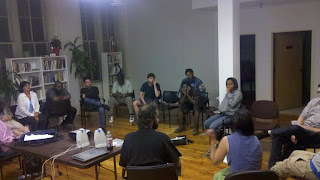 During the meeting there were several moments that when the 30 of us decided to disrupt the proceedings by calling out blatant lies made from Coke's CEO. 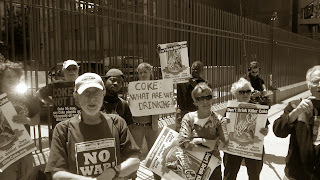 After feeling like our concerns weren't addressed we all decided to take our questions straight to Coca Cola's headquarters on North Avenue where we held a picket at the entrance of the building. Building Resistance and Community in Vine City! It's been such and eventful week in Vine City! With so much going on I've had a hard time making time to update this blog, so I'm going to try to include some of the highlights from the last week and end with a call to action. They've been great! 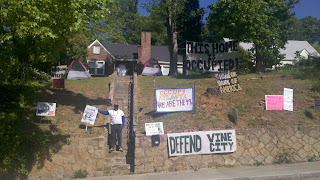 It's really been awesome to see more and more Vine City residents engaging and relating with the Occupy Movement. 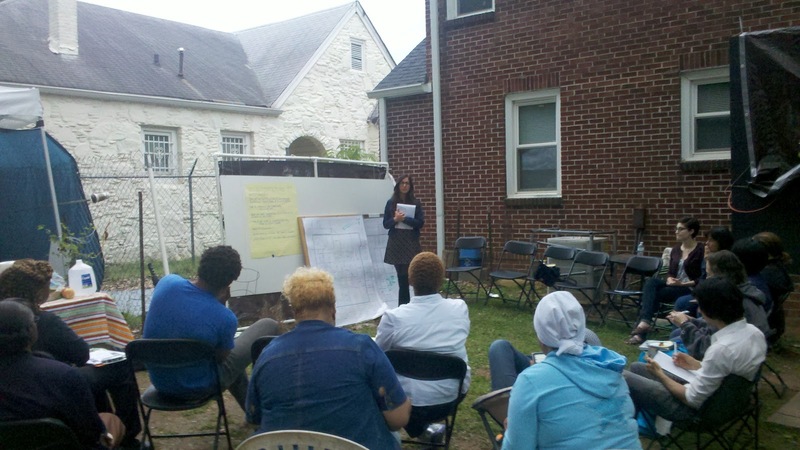 At our last community meeting, after spending time exploring the institutions that have been attacking Vine City for decades, we asked residents if they saw connections between they systems of violence and oppression that have become common place in Vine City and beyond. Folks from the neighborhood had no problem drawing the connections between the school closings, financial institutions, police corruption, drug dealers, and homelessness.Folks in Vine City know what time it is. Several Occupiers had been working with Vine City residents for weeks to build an Earth day event and a Block party. 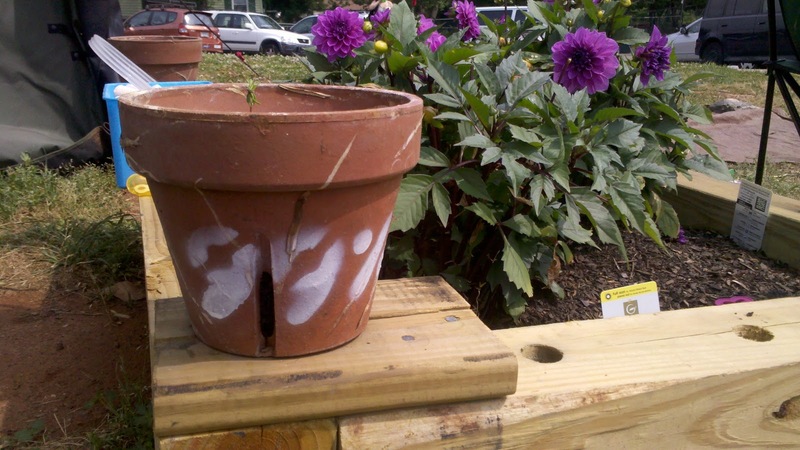 One of the problems residents bring up often is the overwhelming presence of trash in the community and the effect it has on the psychology of neighborhood. It's a fact that abandoned buildings in lower income communities are way less likely to be tended to by the financial institutions that own them then abandoned buildings in wealthier neighborhoods. This fact is painfully obvious in Vine City. This past Friday 36 bags of trash were picked up along Joesph Lowery BLVD, and work was done on several Community Gardens. Saturday folks came out for food, games, friendship, and education. 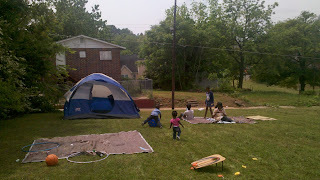 Higher Ground Empowerment Center played host to the event, and lots of kids from the community came out and had a great time. 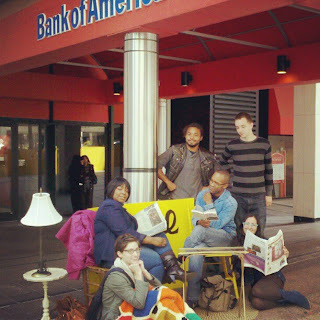 It was a reminder that in a time when we are all relegated to our separate lives, that simply creating space to enjoy our neighbors and learn from each other can be an act of resistance.
. On Monday April 30, the day before her house is set to be auctioned off, we'll be at the Bank of America Plaza in Midtown from 1:30-4pm with one simple message. Make a deal to keep Pamela Flores in her home! Over the past week we've been hitting the streets, knocking on doors, attending NPU and civic association meetings, and organizing events and actions designed to bring Vine City residents together. Today we hosted our second Vine City community meeting and created space for residents to identify the challenges facing their neighborhood, from unemployment, boarded up houses, a growing homeless population, corrupt police, apathetic youth, school closings, trash everywhere, and evictions/ foreclosures the list of challenges is pretty epic. Vine City has been, and is under attack. Although many outside of the community have said that the fight to save what's left of Vine City is futile, every resident we've spoken with over the last three months has said the fight is worth it. It's clear that folks need to get more organized. The banks, developers, and government officials that want the poor folks out are super organized and have access to money. 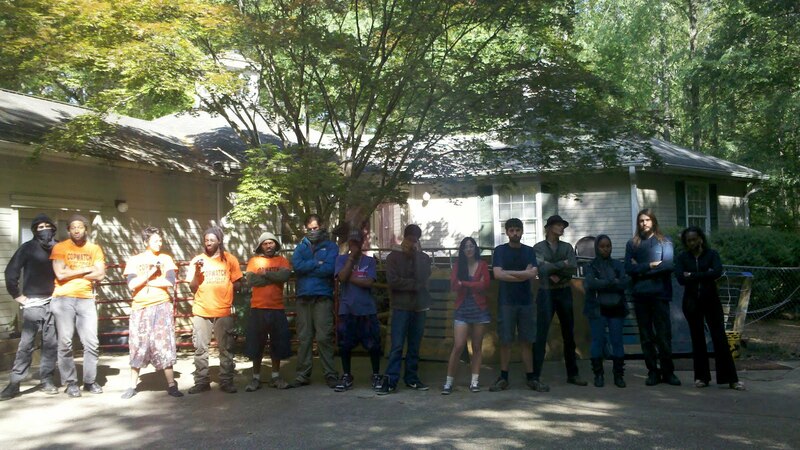 Friday April 20th 4pm: Meet at West End Marta station, march to Bank of America and threaten to move in if they don't give Pamela Flore's home back. Monday 5-7pm: Community Canvassing. 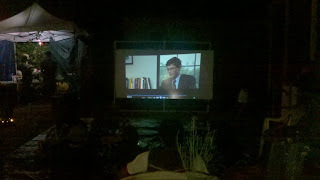 Meet at 245 Griffin st.
Monday April 23rd 7:30pm: Screen and the Green! 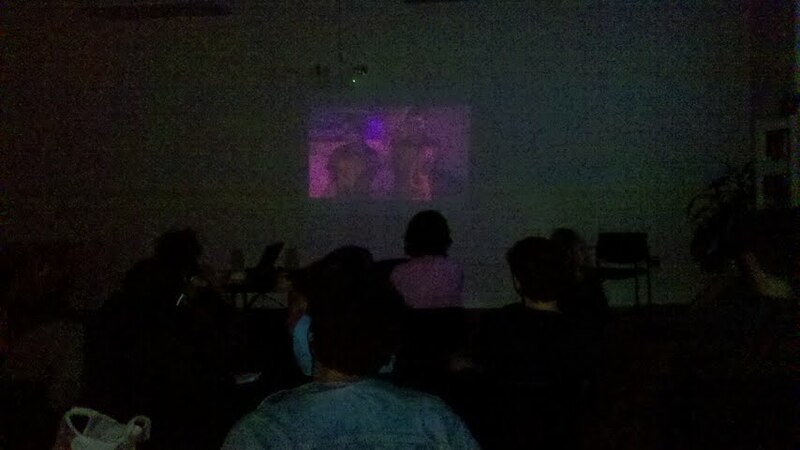 Film screening of "Food Inc" at 245 Griffin street. Snacks provided! Tuesday 5-7pm: Community Canvassing. 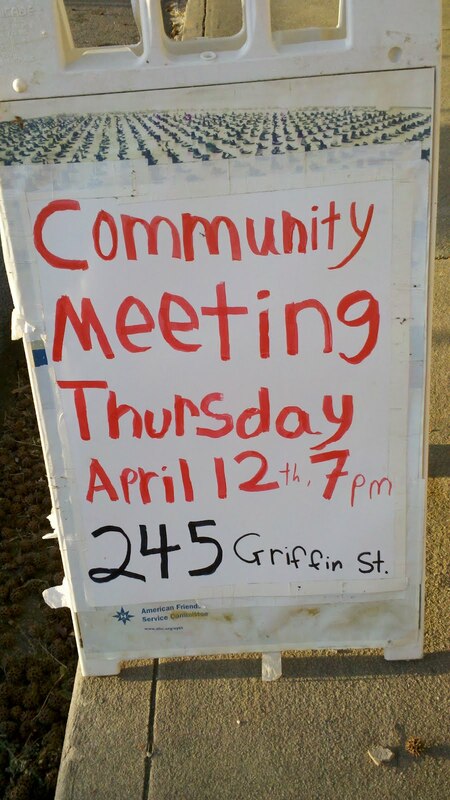 Meet at 245 Griffin st.
Wednesday 6pm: Community walk! Meet your friends and neighbors for a walk around the community. 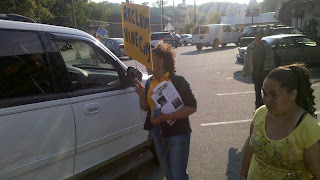 Let's experience Vine City block by block and talk with folks we meet, tell them what we are trying to do to stop the institutional forces that would see Vine city turn into Atlantic Station II. 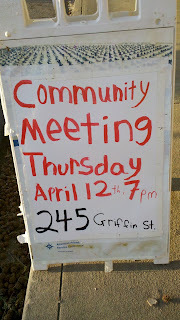 Thursday 7pm: Community Meeting. 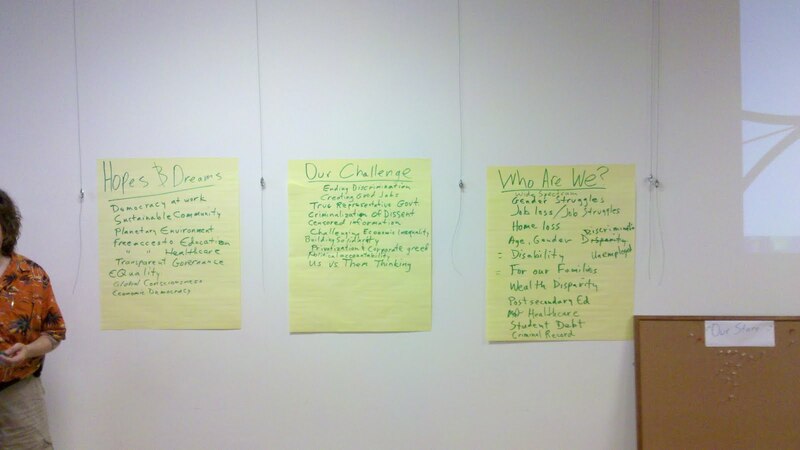 This is where residents organize the change they want to see in Vine City. Food, childcare, and transportation provided. Next week (4/25) at 9:30am, Atlanta's biggest corporation, Coca Cola, is hosting their annual share holders meeting at the Cobb County Galleria. Though you may not enjoy drinking Coke, Sprite, or Mello Yella, you most likely drink Coke products whether you know it or not, they own more drinks stocked on the shelves then any other corporation. Coke is the Earth's most recognizable brand. In Atlanta, Coke's international headquarters, Coke is mostly loved by folks. 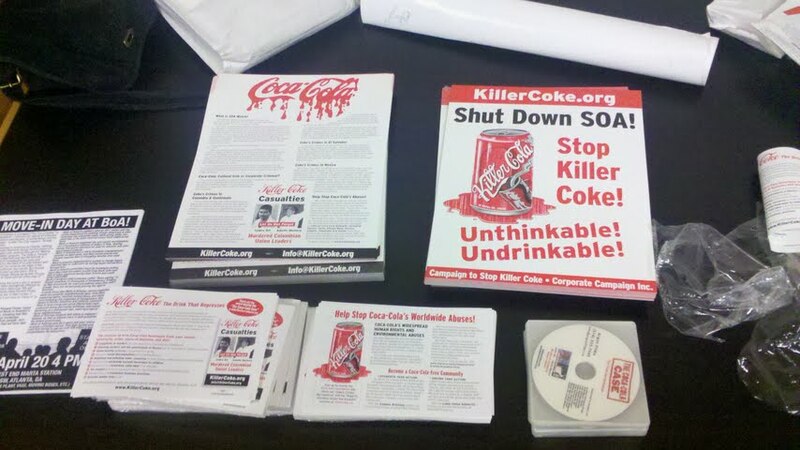 There's a very dark side to the world of coke, one that includes destroying other countries natural resources, and straight up murdering thousands of Latin American union organizers fighting for a living wage. A few days ago AFSC played host to a film screening of "The Coca Cola Case". 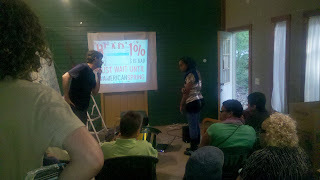 The film screening was organized by Occupy Atlanta and was part of their education campaign leading up to Coke's share holder meeting. Watching the film had a profound effect on everyone who attended. The sentiments in the room drove folks to not only committ to never drinking coke products again, but to also show the film to their networks, and show up at next weeks share holder meeting. 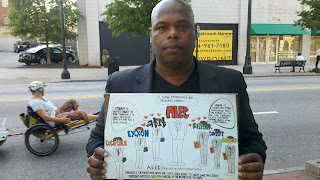 Occupy Atlanta plans to be attend the annual share holders meeting. 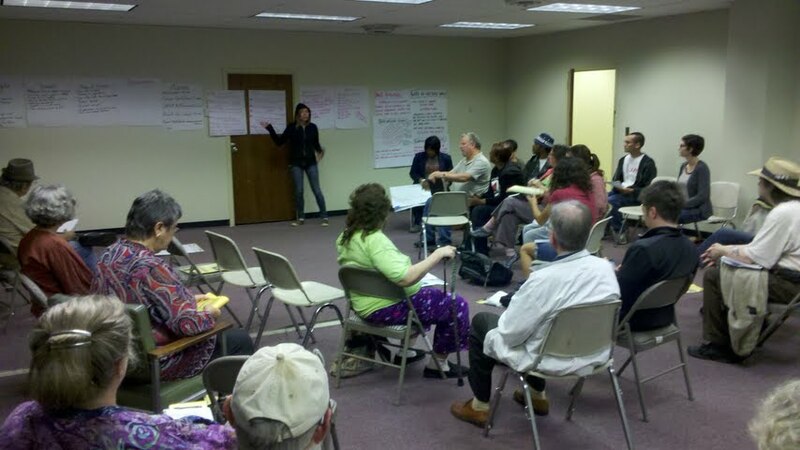 Atlanta's 99% Spring Offensive In The Works! April 9-15th, all over the country, people from all walks of life came together in homes, offices, Churches, communitiy centers, and union halls to participate in direct action trainings designed develop bold, creative, nonviolent direct actions against the institutions of richest one percent that have continued to perpetuate the crisis of economic priority that continues to grant priviledge to those that need it least at the expense of those that nned it the most. 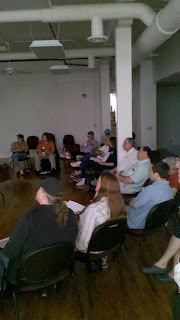 In Atlanta we had hundreds come out to trainings spread all over the metro area. Some trainings were small, others large, all dynamic. 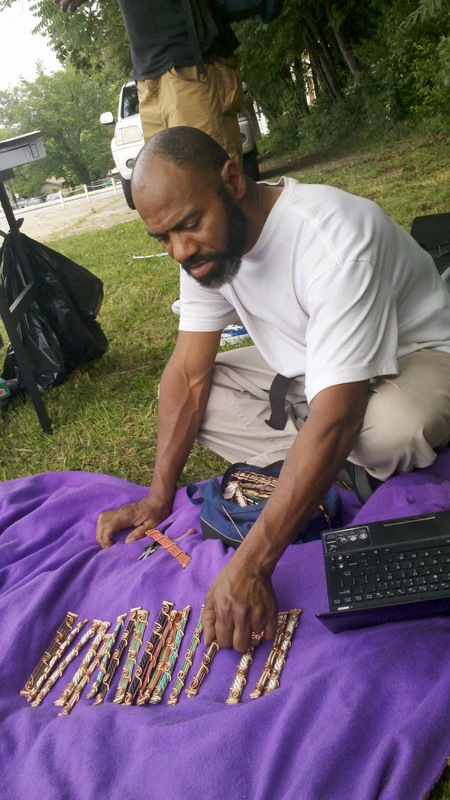 I noticed that many of those who showed up expressed having followed the Occupy Atlanta movement, several had given donations online, or watched protests via livestream, but had never crossed the bridge into active, on the street, participation. 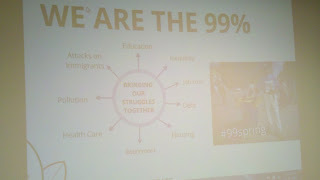 For many, come to the 99% spring training was their first step into activism, and that's a big deal. There's also another mass meeting planned Wednesday the 25th at Troy Davis Park to strategize mass collective actions this spring. We're at a crossroads as a country. Millions have lost their jobs; homes have been foreclosed on; and an unconscionable number of children live in poverty. We have to stand up to the people who caused this and confront the rampant greed and deliberate manipulation of our democracy and our economy by a tiny minority in the 1%. We have a long history of everyday people shaping the direction of our country by standing up for their own dignity and community. Rosa Parks refused to sit in the back of a bus in Alabama and sparked the Montgomery Bus Boycott. 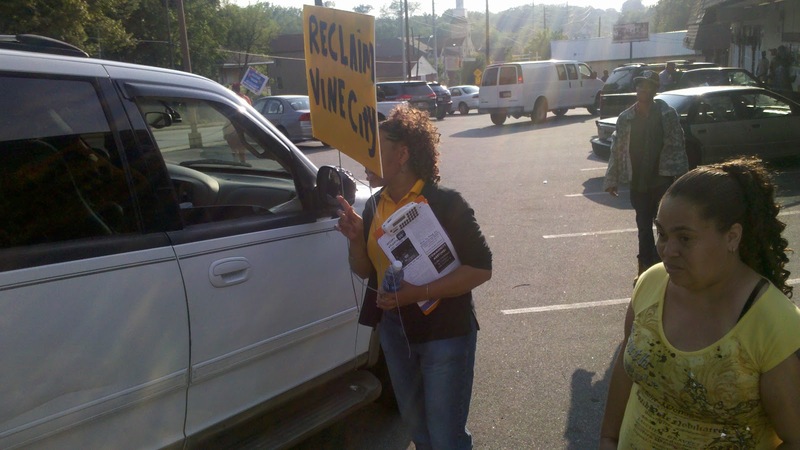 Workers in Flint, Michigan, occupied their plant to form a union. Women took to the streets and held hunger strikes to demand the right to vote. 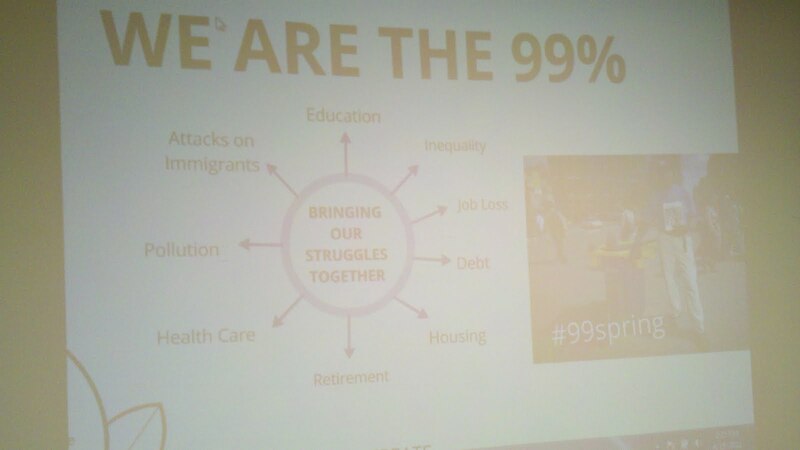 Inspired by Occupy Wall Street and the recent fight for workers in Madison, Wisconsin, the 99% will rise up this spring. We’ll start by training 100,000 people in April to take direct action on our own campaigns to win change. We win change with people power. We will dramatically increase our people power when we train a massive number of people to join in sustained, non-violent action to reclaim our country. Bank of America is at it again! This "too crooked to fail" megabank--notorious for racial profiling, sub-prime lending, robo-signing, and ripping off everyone from investors and insurers to homeowners and the unemployed--is after Vine City resident Pamela Flores's home. BoA is attempting to foreclose on Pamela, claiming that she missed payments during the trial period of a loan modification she received through the "Making Home Affordable" program. The thing is, Pamela Flores never missed a payment, in fact she was never even late, and has all the records to prove it. Instead of investigating her case and admitting their error, the bank is moving forward with plans to auction off her home on the steps of the Fulton County Courthouse next month. But Pamela has no plans to just pack up and leave. She is fighting back, and Occupy Atlanta along with Occupy Our Homes plan to stand with her every step of the way. On Friday, April 20th, we'll pay the bank a visit in another neighborhood that has been dramatically affected by the housing Crisis --Atlanta's West End. 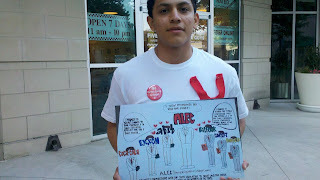 We will demand that Bank of America keep Pamela Flores. and the thousands of others just like her, in their homes. If BoA can't make Pamela's mortgage work, they should expect that we'll be moving in! Please meet at the West End Marta Station @ 4PM, Friday, with a few home goods in tow (house plant, vase, moving box, etc). We'll march over to the West End BoA branch (just across the street) to rally and demonstrate that if BoA goes through with the foreclosure, Occupy Atlanta won't hesitate to "keep house" in any and every branch in the city. 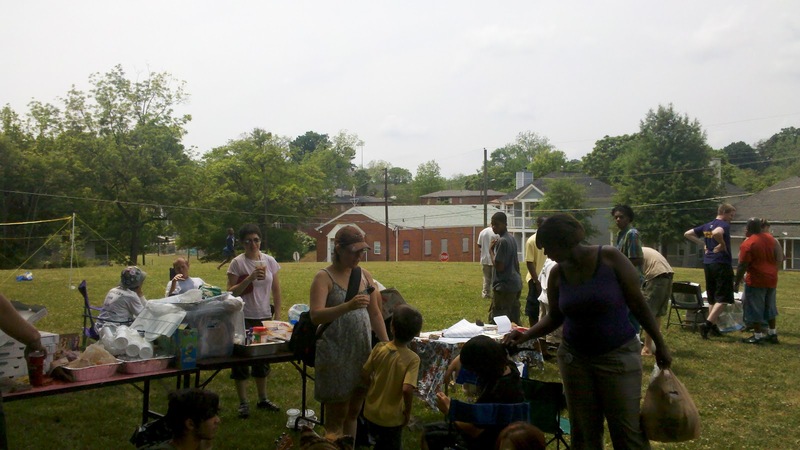 Community Building In Historic Vine City! Driving down any street in Vine City makes it impossible to ignore that this historic park of Atlanta has sustained a tornado of economic violence for decades. 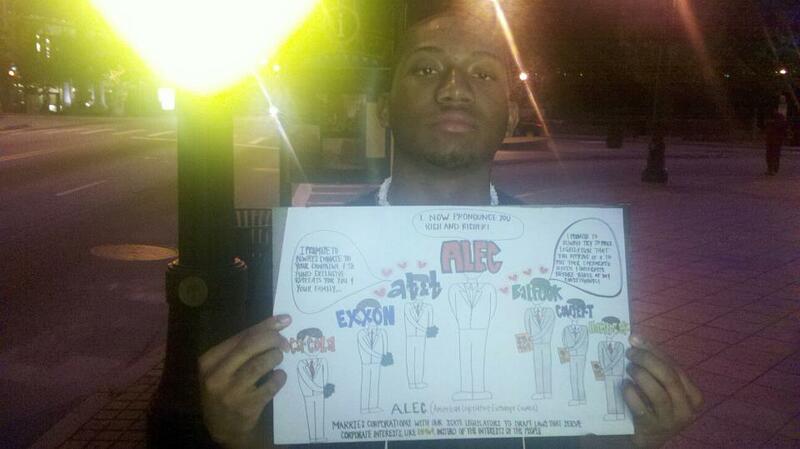 There are more empty homes then occupied homes due to extreme predatory lending . The lack of capital has forced residents out of their homes and into the streets, many have been virtually forced to engage in illegal activity that's further hurt residents. The tactic of divide and conquer has been administered here to disastrous results. Vine City and English avenue really are ground zero for the housing crisis that Atlanta is under the lash of. The work here is vital, and in the three months we've been engaged here there have been sparks of hope. We've saved a church and we're now fighting save a home that's being illegally foreclosed on by Bank of America, we're facilitating weekly clean ups, we're teaching elementary school aged kids to plant urban gardens, we've just started a weekly political education program, we're hosting a weekly community meeting where residents can brainstorm ways to organize their community for change, and we're beginning to engage with folks trying to halt the closing of Kennedy Middle School. 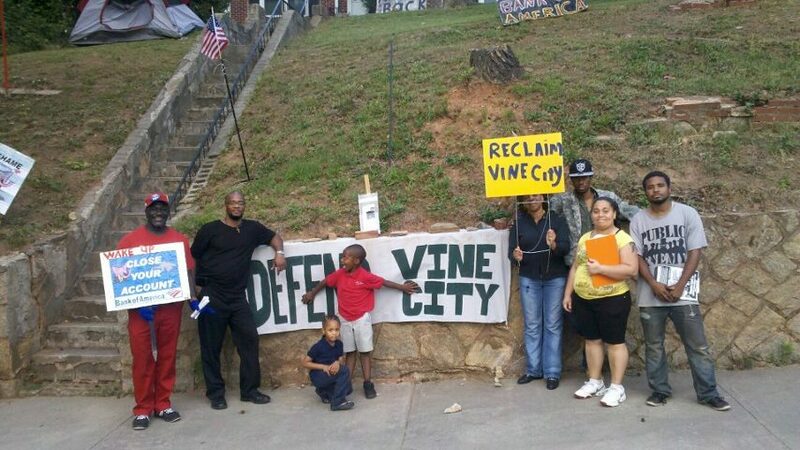 It's a start, and there's no doubt that what Vine City needs is a Vine City movement led by Vine City residents. It's an uphill battle against unprecedented wealth disparity, but these days the impossible feels more possible than any time in recent history. There's power being built in Vine City, and you're invited to participate! Come by our new headquarters at 245 Griffin Street. It's a 24/7 operation. We Will Not Be Moved!! 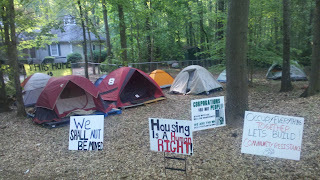 The last 24 hours at Occupy Atlanta’s South Dekalb home Occupation (Chris Frazer’s home) have been prolific. Yesterday at 6pm Chris Frazer’s home played host to launch of the 99% Spring Offensive trainings in the Atlanta area. Union members, Church Members, folks from local grassroots organizations, and occupiers came together to talk about the economic crisis, tell their stories, engage in direct action training, and make plans for a Spring offensive that targets the institutions of the richest 1% who have been disrespecting our human rights for decades. 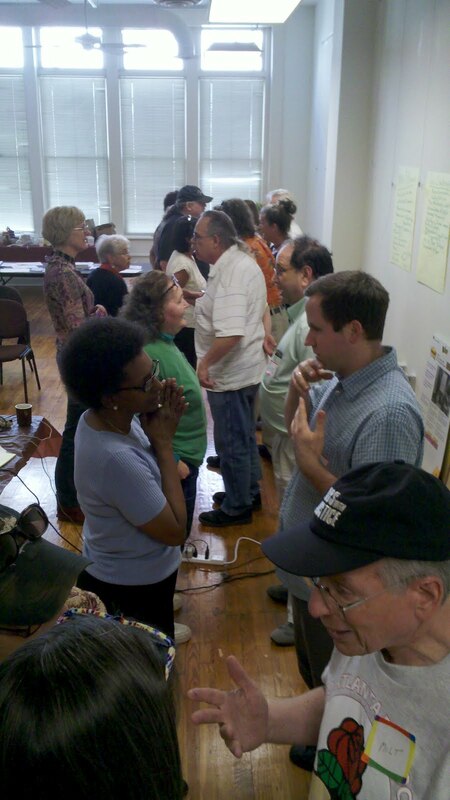 There are around ten of these trainings scheduled in the Atlanta area, at churches, union halls, community centers, and homes across the metro area. Today that direct action training came in handy. 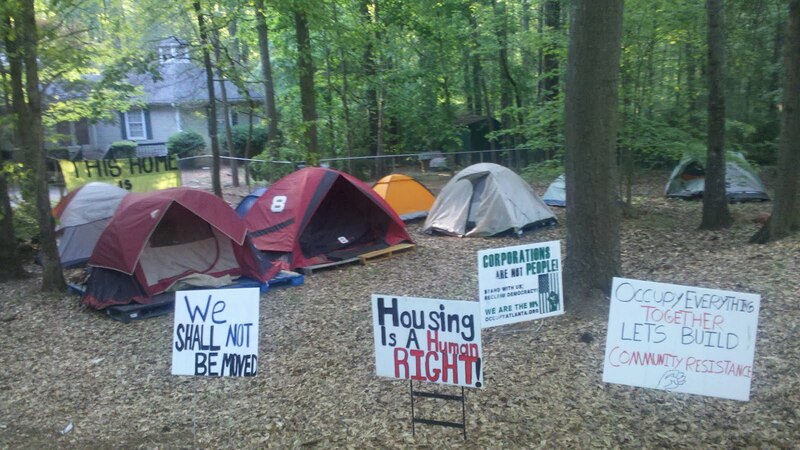 Occupiers, who have been camping in the yard of Chris Frazer, where awoken at 8am this morning by the sound of two Dekalb County Marshall's who drove their patrol cars onto the property and requested to meet with the owner of the home. The Marshall's decided to back off, possibly due to the fact that a small tent city has amassed on the Frazer’s home in an effort to resist another eviction in the down trotted community. Twenty minutes later eight patrol cars showed up, claiming to be on a routine patrol on the usually quite street. 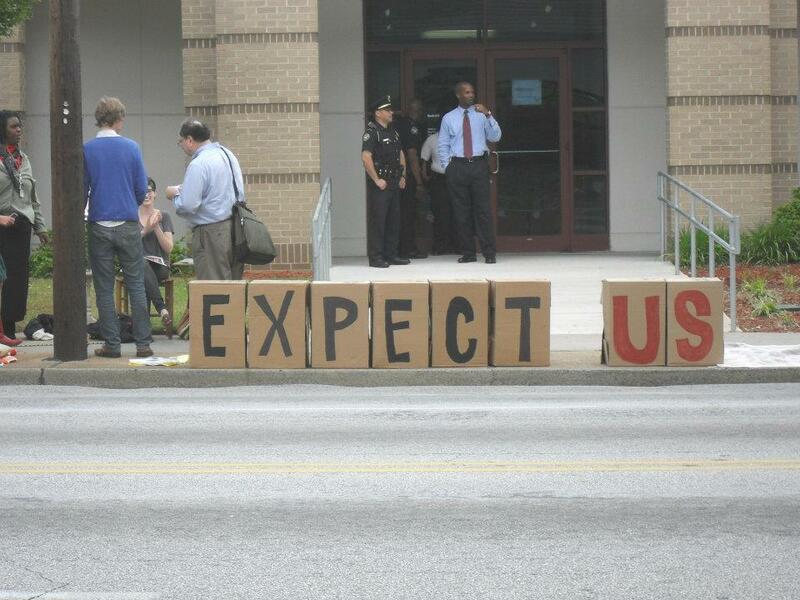 One of the occupiers decided to block the road at the entrance to 3662 Wellhaun drive, police then arrested him. 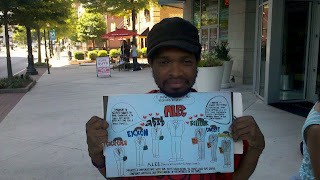 Other occupiers focused their energy on mobilizing the community and other Occupy Atlanta folks. 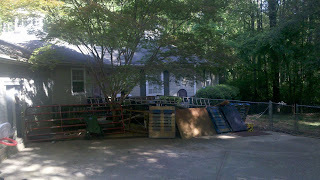 Within an hour there were around 20 folks in the yard, and a barricade had been built around the entrance of the Frazer home. The message today was load and clear, no more foreclosures, no more evictions, we are not leaving, no one may take this home from the Frazers. Over and over again we have heard from community members all over the city that neighborhoods need people, not more empty homes, and not more boards on windows. It’s time we stand up to the institutions that caused the crisis. If they attempt to shut down hard working, everyday people, then perhaps it’s time we shut them down. The foreclosure crisis hit Vine City hard. Now, only 15% of residents own their homes and many of them are facing hardship, like resident Pamela Flores whose property backs up to Martin Luther King III and City Councilman Michael Julian Bond’s home. Pamela bought her home at an inflated amount in 2006, the height of the crime spree at the hands of American banking institutions. 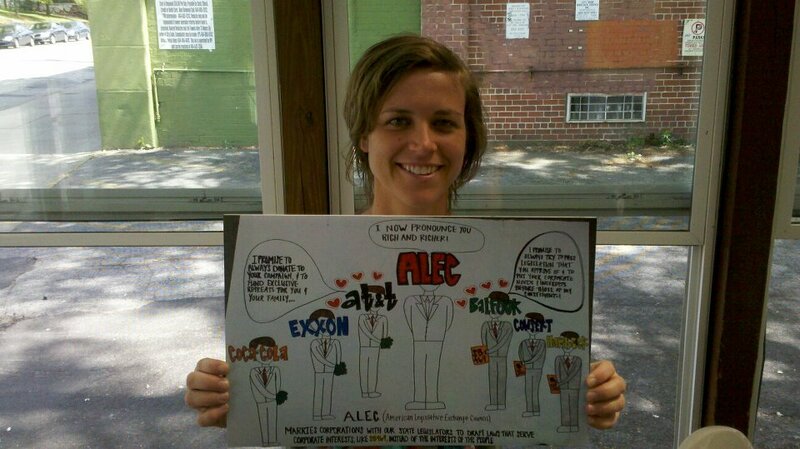 In 2009 she attempted to get a loan modification with Bank of America through the “Making Homes Affordable” program. The bank told her that in order to qualify she needed to miss 3-4 mortgage payments; this is a scam that has already put countless Americans out of their homes. During the time she missed payments, at the banks request and in order to meet the loan modification criteria, she fell into foreclosure. By qualifying for the “Making Homes Affordable” program foreclosure was temporarily avoided. Pamela began to pay trial period monthly payments for the “Making Homes Affordable” program. 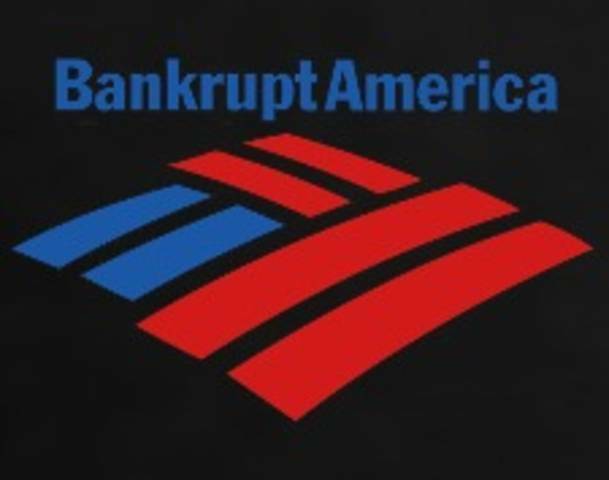 When it was time for Bank of America to grant her the promised modification, they instead mailed her a notification alleging that she failed to make four out of five payments. Her home, unknowing to her, was slated for auction at the Fulton County courthouse during the time the bank claimed to be researching their records for the “missing” payments. The thing is, Pamela Flores never missed a payment, in fact she was never even late, and has all the records to prove it. Pamela was forced to file Chapter 13 and 7 in order to stop Bank of America from stealing her home. 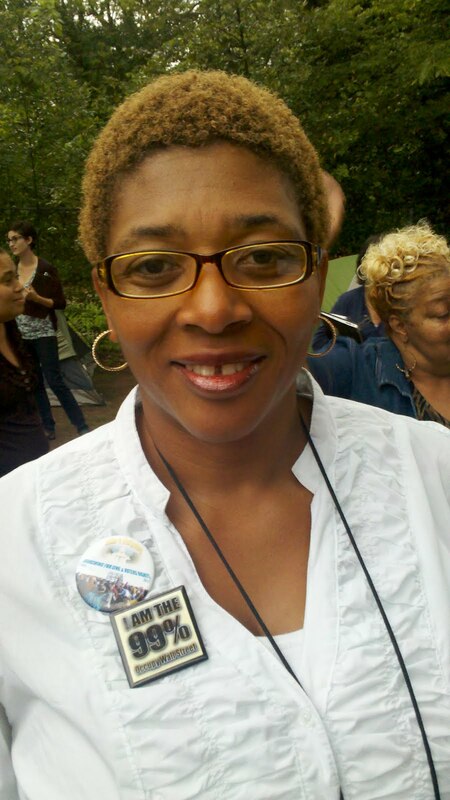 The act of filing has stopped Pamela from being able to recieve a student loan she had formally been approved for in her effort to pursue a masters degree at Emory University. Her ordeal with Bank of America has forever impacted the course of her life. The home she paid over $180k for is now appraised at $38k. 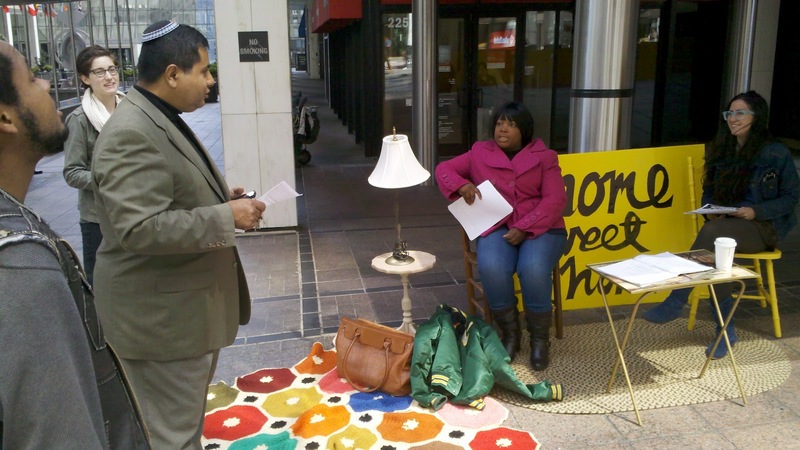 Since she reached out to Occupy Atlanta a few weeks ago, we were able to work with the Rainbow Push Coalition to put off her home auction for one month--but that’s not good enough. 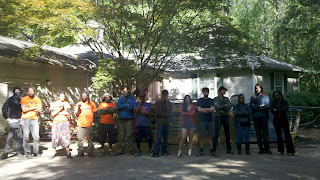 Occupy Atlanta and the newly formed Occupy Our Homes - Atlanta will begin a full scale occupation of Pamela’s home until Bank of America makes a deal to keep her in it. 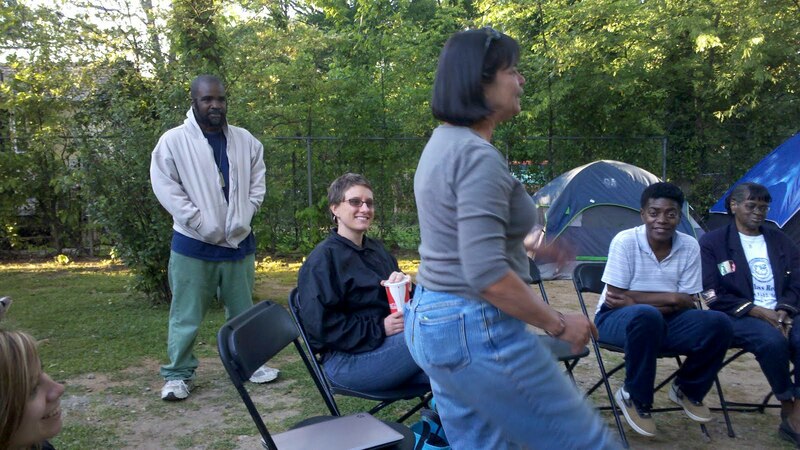 Occupy Atlanta and Occupy Our Homes will work with her community to establish a base for defending other homes at risk of foreclosure and eviction. We plan to target private and public institutions that continue to disrespect Vine City residents. 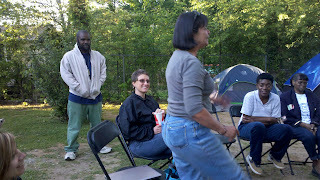 Occupy Our Homes Atlanta is committed to maintaining a 24/7 presence at the home of Pamela Flores until Bank of America makes a deal that keeps her in home. 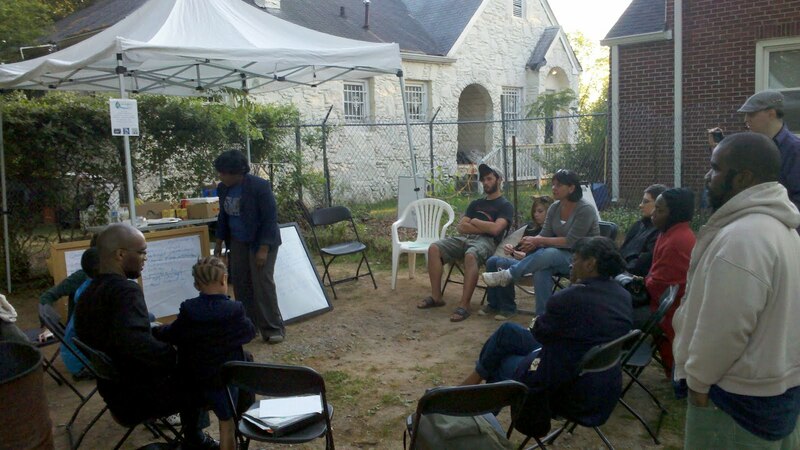 During our time here we also plan to work with the Vine City community to create a hub, at Pamela's home, for eviction/foreclosure defense. We invite folks from surrounding communities who are struggling with housing issues to come down to 245 Griffin Street, Atlanta and work with us to build the communties we can survive and thrive in. Local CBS coverage of the press conference today. 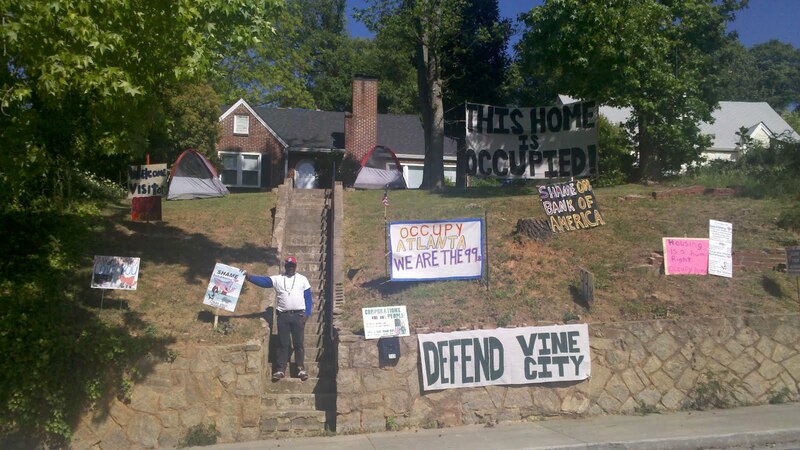 Tomorrow, April 9th, at 11AM Occupy Atlanta will host a Press Conference on the lawn of Vine City resident Pamela Flores’ home at 245 Griffin Street. Councilman Michael Julian Bond, Ralph David Abernathy III, Pastor Dexter Johnson, and representatives from Communication Workers of America will join. This is part of the Occupy movement's 99% spring offensive that American Friends Service Committee is helping to organize locally by provided venue space and trainers. In 2008, we discovered that bankers and speculators had gambled with our most valuable assets, our homes--betting against us and destroying trillions of dollars of our wealth. Now, because of the foreclosure crisis that Wall Street banks created with their lies and greed, millions of Americans have lost their homes and one in four homeowners are severely underwater on their mortgage. Not only do we have thousands of people without homes, we have thousands of homes without people. Boarded-up houses are sitting empty--increasing crime, lowering the value of other homes in the neighborhood, erasing the wealth that lifts families into the middle class. The foreclosure crisis hit Vine City hard. Now, only 15% of residents own their homes and many of them are facing hardship, like resident Pamela Flores whose property backs up to Martin Luther King III and City Councilman Michael Julian Bond’s home. The spokesperson for the Vine City resident is Georgia State Certified Mediator Al Bartell who will be communicating on her behalf. Since the door seems wide open to futher education about what the American Legislative Exchange Counsel(ALEC) is, how it works, and how it's reshaped our lives I thought I'd do a little photo project. 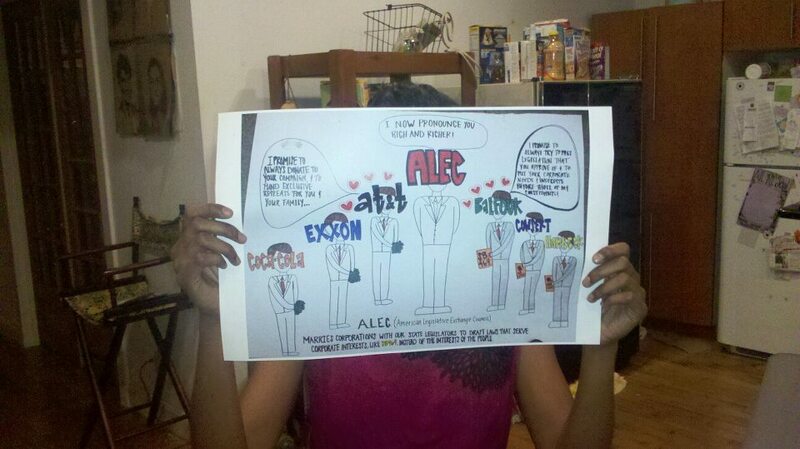 Before asking anyone to pose for a photo I am tasked with explaining exactly what ALEC is and why folks should be concerned with such a shady crew. 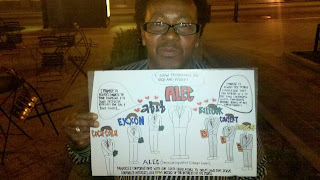 Then I snap the mug shot style photo of the subject holding a rather excellent comic explanation for how ALEC works with my phone, post it to facebook, and make sure I tag the person(which means I have to friend them). After their mug is tagged their friends may ask them questions about what it means, and hopefully my brief conversation will arm them with the facts they need to school folks. I just started this today, and I think it's gone well, lots of great conversations. I have about 15 more ALEC comic pieces mounted on posterboard, and I'm more than happy to run down the skinny on my ALEC pitch. I'm thinking about trying to recruit a few folks to work on this. If you're interested send me an email. So far I've taken about 35 mugs of folks, wouldn't it be great to have thousands?